JLL has completed a 15-year lease for 44,718 s/f of office space with Gunderson Dettmer Stough Villeneuve Franklin & Hachigian LLP for Global Holdings Management Group’s NOMAD TOWER, 1250 Broadway. Gunderson Dettmer, a leading international law firm, will relocate from 220 West 42nd Street to occupy 44,718 s/f of space on three full floors, including the 20th through the 22nd floors. NOMAD Tower was represented by Paul N. Glickman and Mitchell Konsker, vice chairmen; Benjamin Bass, managing director; Diana L. Biasotti, senior vice president; and Harley Dalton, vice president, with JLL. Craig Panzirer, senior vice president and director of leasing, represented Global Holdings Management Group in-house. Gunderson Dettmer was represented by John Mambrino, vice chairman; and Nick Farmakis, senior managing director, both with Savills Inc.
“NOMAD TOWER has attracted tenants from a variety of sectors in recent months and offers an ideal environment for a dynamic law firm like Gunderson Dettmer,” Glickman said. Gunderson Dettmer is the third tenant to sign a major lease at the building under the ownership of Global Holdings, which purchased the property in 2016. Zillow Group leased 130,000 s/f in late 2018, and Transperfect closed a lease for 123,000 s/f in February. 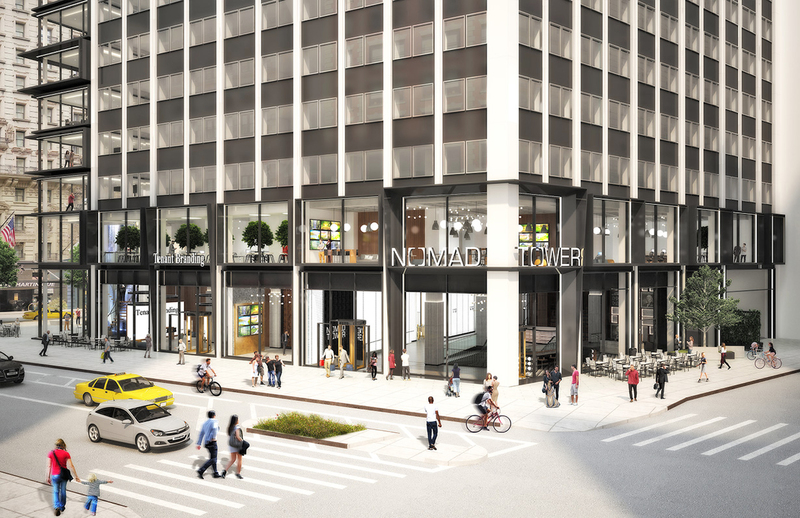 Global Holdings is now completing a $50-plus million capital improvement campaign and repositioning effort for NOMAD TOWER. The repositioning features a new lobby and amenities, including a two-story amphitheater with seating for nearly 100 people and a multi-faceted, tenant-only amenity lounge. The theme “Love Your Workplace” is behind the building improvements, including the extensive amenity options.